“Return of the Gods Part. 1” this weekend at 38, curated by Edwin PHADE Sacasa, the founding artist of The Mighty Shirt Kings, the Pioneers Of Hip Hop Fashion. The exhibit will raise fund’s to restore and recreate the epic 15 block Crenshaw mural, featuring artist that created the historic mural that has been featured in ‘Boyz n the Hood’, ‘Menace II Society’ etc. The artists include Mark7, King Phade, King Cre8, Adah (@afropuff), Snake Doctor,Ink One and Aiseborn and more. The exhibit will be on view through February 16th. 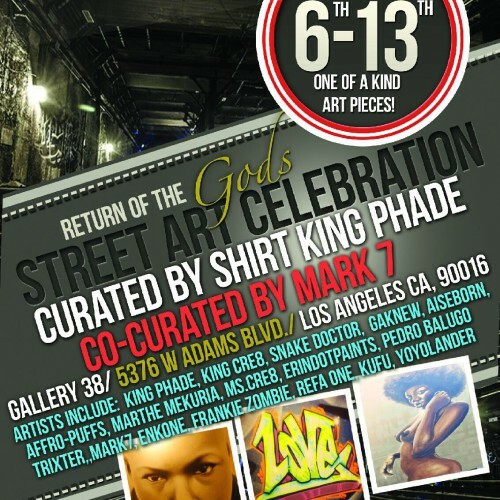 The group show will include artists who’s works have been on display in The Getty, MOCA and California African American Museum including King Phade, King Cre8, Mark7, Gaknew, Adah, Trixter, Teza Marthe Makuria, Aiseborn, Pedro, Yoyo Lander, Snake Doctor, Kufu Frank Zombie, Enkone, Erindotpaints, Tanya, Refa One, Noni. The exhibit will raise fund’s to restore and for recreation of the Crenshaw wall. Curated by Edwin PHADE Sacasa, the founding artist of The Mighty Shirt Kings, the Pioneers Of Hip Hop Fashion with its signature 1980’s style of loud, colorful, and filled with cartoon imagery on clothes; but not just any cartoon imagery for the cartoons where urbanized. Mickey Mouse with a Fila suit, Casper the Friendly Ghost with gold teeth, Roger Rabbit with a flat top hair do and Pink Panther with gold chains and guns – it was the reinterpretation of American classics but with an urban and gangster lean. The Shirt Kings were the inventors of this style and everyone across the city was well aware and made there way to Jamaica, Queens to a small shopping mall known as the Coliseum where you could easily bump into the biggest names in Hip Hop of the day placing their orders. From DJ Red Alert to LL Cool J to Big Daddy Kane to Mike Tyson – they all had to have their Shirt Kings designs. By adapting the graffiti skills from the trains and spray cans to shirts and airbrush, Edwin PHADE Sacasa and The Shirt Kings created a new look for a new generation.